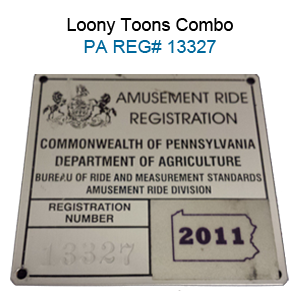 The Loony Toons Combo Unit is licensed and registered in Pennsylvania. Please click here for pricing and availability. The licensed, Looney Tunes Combo Unit brings the wacky antics of Bugs and pals to your event! The lively artwork features Bugs Bunny, Daffy Duck, Sylvester the Cat, Wile E. Coyote, Tasmanian Devil and sweet little Tweety bouncing away and letting loose. Players have the choice of four gleeful activities, even a slick climb and slide that can be used wet or dry. This Loony Toons Combo Unit offers up to four different activities for endless hours of activity. Each combo unit has a large interior jumping area and a basketball hoop for group interaction, and high-visibility mesh allows spectators to keep an eye on participants. This unit also comes with a climb to conquer with a fun and fast slide, entertainment for even the most active child! Each bouncy castle is manufactured with lite n strong™, fire resistant vinyl for safety, durability and portability for any indoor and outdoor party.